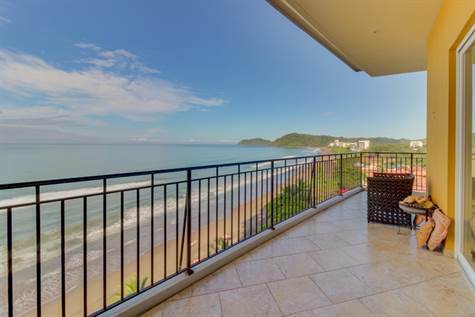 " Incredible ocean, mountain and city views"
Enjoy incredible ocean, mountain and city views from this large beach front condominium. This luxurious residence includes a spacious living area, three bedrooms, three plus a half bathrooms, incredible open room with gourmet kitchen area and sunset perfect terraces. appliances, solid wood doors, Italian cabinetry in Kitchen and Bathrooms and hardwood accents throughout each home. These luxury homes have the best the Pacific Coast has to offer with incredible breathtaking views of the entire town, Jaco’s cinnamon sand beach, the lush tropical mountains and most importantly, the unforgettable Pacific Ocean. Amenities include 100% power back up, large designer pool with Jacuzzi spa, dedicated parking, and green area. Vista Las Palmas Beachfront Condominiums are fee simple property and title guaranteed. Each owner will have the option to include their unit in a Rental Program. Vista Las Palmas offers the luxury of beachfront home ownership with the conveniences of a first-rate vacation resort.